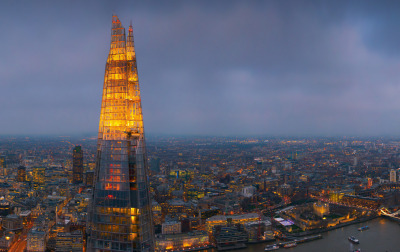 After the guided walks in several London boroughs of recent years, we continue our exploration of the city's most vibrant architecture with a visit to the viewing gallery on top of the Shard. We will start the event with an exclusive presentation by Bart Lemmens, the project manager who oversaw the construction of the top of London's largest building. He will share some architectural and technical details about the building, talk about his experience during construction and there will be an opportunity for Q&A. Following the presentation, we will go to The View from the Shard around 16.00 so just in time to experience the sunset over the city. A first stop will be on level 69. Here, in the sky above London, we’ll experience an 360 degree, 64km view over the city and beyond where the past, present and future of London will be unfurled, brought to life in multimedia displays. For the best view in town, we will then ascend to Level 72, at 244m, the highest public level of The Shard. We’ll be exposed to the elements with sounds of the city around us. VCL members will receive a 20% discount to the normal ticket price. Non-members will pay the full fee. The cost includes the exclusive presentation by Bart Lemmens. Where: We will start the presentation at The Exchange, Fielden House, 28 London Bridge Street, SE1 9SG London. After the presentation, we will cross the street to the Shard.